It’s a bit difficult to find great and non industrial cheese at reasonable prices, that’s why I was really surprised when I found “Quesería Cultivo”. Three cheese masters from different parts of Spain (one of them jumped into the spotlight when it was discovered that he made personalized cheese for top Michelin star restaurants) opened this dairy with the purpose of offering a fair price for both cheese producers and consumers. They work with both young and expert cheese makers. You can find cheeses from Spain, England, Holland, Italy, France…Their only requirement is to know how the whole process of traditional cheese making has been done. 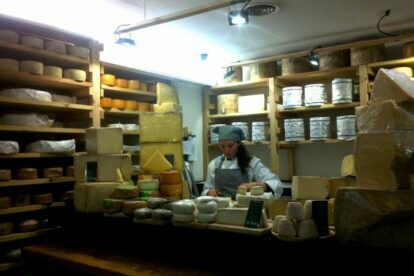 When I got there I was so astonished by all the different types of cheese that I couldn’t make up my mind. But they kindly recommended the perfect one according to my preferences. Although that’s not all, one of the best things about “Quesería Cultivo” is that on the same street, two numbers down (Calle Conde Duque, 13) there is “Panic”, a bakery where I’ve found the most delicious bread ever in Madrid. The key is the sourdough, and believe me, don’t hesitate to pay the € 3.50 for an enormous bread that will last for more than 4 days. It’s amazing! They also sell homemade cakes made by APAI (a foundation that helps children with Down syndrome). The strong smell of cheese followed by the smell of bread freshly baked will make you fall for these two stores, what a glorious combination! !